Established in 2000, Kiwi Audio Visual continues to redefine the quality standards for the design, installation and service of top tier, custom home entertainment systems. Whether you’re building a new home or revamping your existing residence, the experts at Kiwi AV will work with you and your design team to visualize and create the ultimate, fully integrated system for your home. Our mission is to provide discerning clients with high performance home theatre and whole house audio/visual systems at an unrivaled level of service and with an unmatched drive to sustainability. For You, We ’ll Fly! You can buy home electronics components here, there, and everywhere. But Kiwi Audio Visual provides its clients something far more significant and valuable. Kiwi assures the best possible home electronics & control solutions that are custom-designed for your home, installed by certified and professionally trained technicians. 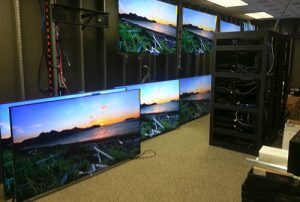 Kiwi Audio Visual chooses the finest home technology products. We integrate the products into functional system solutions and install them so they blend seamlessly with the decor of your home. If you are working with an interior designer, Kiwi Audio Visual works with them to make sure the process is seamless and easy. At the end of the install, you will be able to program your system so it works effortlessly at the touch of a button. From home theaters, motorized shades, wireless apps, iPad control to Smartphone monitoring, Kiwi is always current with your home technology needs. What do we provide for you and your family? Your investment in your home is valuable to you and to us. Kiwi makes sure before the install is completed that you are satisfied and understand your system. We have a Rapid Response team that is available within 24 hours of your call; if you are needing emergency service or need help in the future. This Rapid Response is on-call for our clients each week of the year. 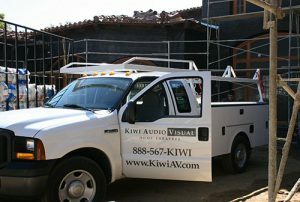 Kiwi Audio Visual provides an uncommon degree of expertise and craftsmanship, grounded by a work ethic that is uniquely Kiwi. We will do whatever it takes to make your solution work and to keep it working to your satisfaction. Our goal is to keep you happy. Client and customer satisfaction is our first promise to you. We care about our clients. We also care about excellence in our service as business and a company that you can trust now and in the future. Home technology comes in various forms now. From home theaters, to the multi-media room, to home automation, motorized shades and lighting control or to smart home surveillance. Invest in your home by keep up with technology. If you are building a home, we will work with you from the ground up to make sure your dream home is streamlined with home technology that meets your family’s needs. Remodeling and upgrading also fits in for the time to upgrade your home technology. Kiwi Audio Visual offers a free consultation at no expense to you! Kiwi streamlines the process of achieving the system of your dreams. First we’ll discuss all the amazing possibilities for your home and budget. Next we’ll custom-tailor a system that will surpass your design and performance expectations today, while remaining open for the technology of the future. Your custom Kiwi AV system starts with an advanced wiring network. All wires are seamlessly and invisibly embedded into the walls and linked to a central gateway that serves as the hub for all electronic components. Then our experts will assist you in choosing the perfect, top-tier audio and video components from our preferred list of manufacturers and suppliers. The end result is a completely integrated, elegantly installed home entertainment system that’s perfectly suited to your sophisticated lifestyle. Our team offers complete, in-house engineering and programming expertise. Our installation technicians are highly experienced and certified. At Kiwi, we specialize in customer service that complements the quality of our systems. We take the time to ensure you receive proper instruction on how to operate and maximize the enjoyment of your new home entertainment system. Long after your installation, you can count on Kiwi AV for responsive service and technical support. To explore the most sophisticated, custom tailored home entertainment options for your home and lifestyle, contact the experts at Kiwi AV today. The real Kiwi is a rare, flightless bird, but our team will FLY for you.